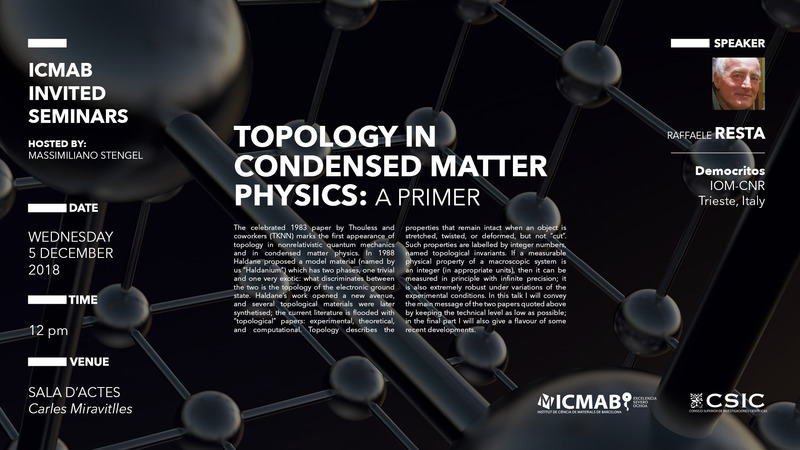 The celebrated 1983 paper by Thouless and coworkers (TKNN) marks the first appearance of topology in nonrelativistic quantum mechanics and in condensed matter physics. In 1988 Haldane proposed a model material (named by us “Haldanium”) which has two phases, one trivial and one very exotic: what discriminates between the two is the topology of the electronic ground state. Haldane’s work opened a new avenue, and several topological materials were later synthetised; the current literature is flooded with “topological” papers: experimental, theoretical, and computational. Topology describes the properties that remain intact when an object is stretched, twisted, or deformed, but not “cut”. Such properties are labelled by integer numbers, named topological invariants. If a measurable physical property of a macroscopic system is an integer (in appropriate units), then it can be measured in principle with infinite precision; it is also extremely robust under variations of the experimental conditions. In this talk I will convey the main message of the two papers quoted above by keeping the technical level as low as possible; in the final part I will also give a flavour of some recent developments.